The Oyasama Birth Celebration Service was conducted at Tenrikyo Church Headquarters on April 18 to commemorate the 210th birthday of the everliving Oyasama, our beloved Parent who guides us toward the Joyous Life for all humankind. Great numbers of followers, including many from overseas, returned to the Home of the Parent to celebrate this festive occasion. Shortly after 10:00 A.M., the Shinbashira, accompanied by the other Service performers, arrived in the Main Sanctuary after having paid respects at the Foundress’ Sanctuary and the Memorial Hall. He ascended the dais and delivered the Service prayer to God the Parent on behalf of all followers. The prayer was followed by the Kagura Service, which, reenacting God’s creation of humankind and the world, seeks to call forth the blessing of universal salvation. Then, the Dance with Hand Movements was joyously performed while the followers joined in singing the songs for the Service in high spirits. 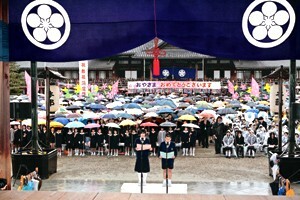 Immediately following the Service, a musical event called “Joyous Chorus” was conducted in the Inner Courtyard, where thousands of followers joined in singing a number of songs, including “O-uta 12: Path of the Divine Model” and “Oyasama’s Birthday Celebration Song,” to the accompaniment of music provided by students of Tenri High School and other Tenrikyo schools as well as members of Tenrikyo Institute of Music. Oyasama Birth Celebration Service, Tenrikyo Church Headquarters.